U.S. Army Commendation Medal (ARCOM); Gulf War Medal with two Bronze Stars; U.S. Army Good Conduct Medal; Three Army Achievement Medals; Liberation of Kuwait Medal. 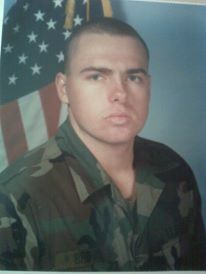 Tobias Brown attended Basic Training at Fort Dix, New Jersey, followed by AIT at Fort Eustis, Virginia, with the MOS of 68J10-X1. After AIT, he reported to Delta Company, 1-227th Aviation Regiment, First Cavalry Division, Fort Hood, Texas. There he was an Aircraft Armament and Fire Control Specialist for the AH-64A Attack Helicopter. Tobias engaged in combat operations during the Gulf War of 1991. Tobias and his battalion would serve as the vanguard of the division's movement north to cut off the retreating Iraqi Republican Guard Division in Basra, Iraq. Tobias Brown grew up in Lakewood and graduated from Lakewood High School in 1988.